I miss my favorite mug… no doubt. The mug I took a photo of and titled the photo “Grace”, because I thought it had been spared in an unfortunate fall off a coffee table. 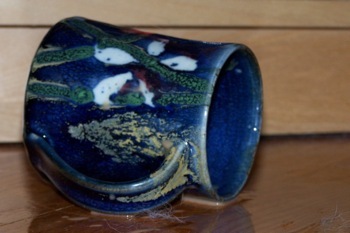 Then I blogged about how it wasn’t grace after all, because the mug ended up being broken Sigh. Well, yesterday my friend Steve surprised me by having other district clergy bring a mug to district meeting… so now I have three new mugs! And a box of kleenex for the next time–may it never happen–I break a mug. Not only that, but the box of kleenex actually matches one of the mugs. Another mug has Zion Church’s phone number (which is great, because now I can call Steve and Andy anytime I want!). And the other mug has a nice photo of a church in the UP. Thank you, Steve.. thank you, District Clergy. You gave me a glimpse of grace, humor, laughter, and some joy. “Sending you love and support in this difficult time. We pray in earnest that you have overcome the grief caused by the loss of your favorite coffee mug. The other day one of my favorite mugs fell when I bumped a side table. A little coffee spilled, and I was so upset… This mug is from Saskatchewan. A friend up in Prince Albert bought for me when I was on internship there (1995-1996). I think, if I remember correctly, that a few friends were going to Saskatoon for the day, and asked if I wanted to go. Which, of course, I wanted to… but I was probably working on sermon or something like that, so couldn’t go. But when my friend returned, she had bought this mug for me. I love it. I have always loved it… sigh. So back to the other day. The mug fell. I screamed, and was distraught. Then relieved, as I realized it wasn’t broken. 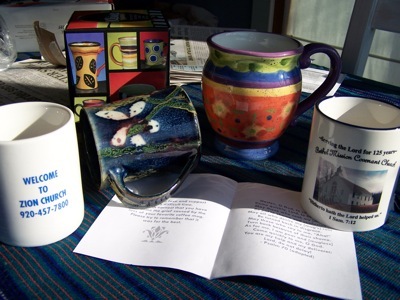 So I took a picture for the “Lenten Views” gallery, and titled the picture “Grace” because the mug was still intact. I just spilled some coffee on the side, when pouring it from the thermos. Or I set it down in a wet spot on the counter, by the sink, when pouring coffee. But no, it’s broken..
Bummer. Maybe not “Grace” after all. Maybe just a reminder that life happens–mugs break, light-bulbs burn out (this happened a few minutes after I realized my mug was broken today), and “some days are like that, even in Australia”. If I wanted to be all theological and spiritual, I could come up with some way that God is still present in the breaking-of-my-mug. And maybe God is. Probaby. But the fact is, my favorite mug is cracked. And it’s a sad thing. Oh well. Life goes on. Monday’s here, with lots to do. Time to think about other thing, like Sunday’s bulletin and sermon.